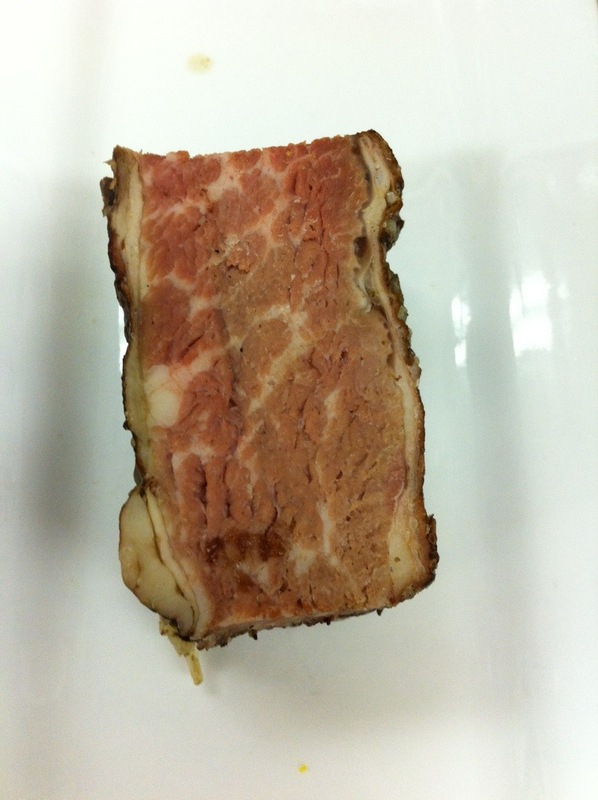 In a previous post, about a year ago, I made beef short ribs in a pressure cooker. The cooking time on them was 45 minutes, when I cook short ribs in an oven I go about 10-12 hours at 225°F, the way of the water bath we are about to embark on will take 3 days/72 hours. 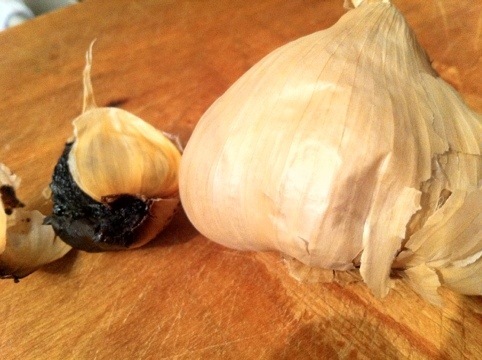 One benefit in cooking the meat this slow will allow you to have a higher yield by about 30%. From the numerous resources that I have read on sous vide short ribs you want to have your water bath set to 135°F which, where I live, is too low for the government. 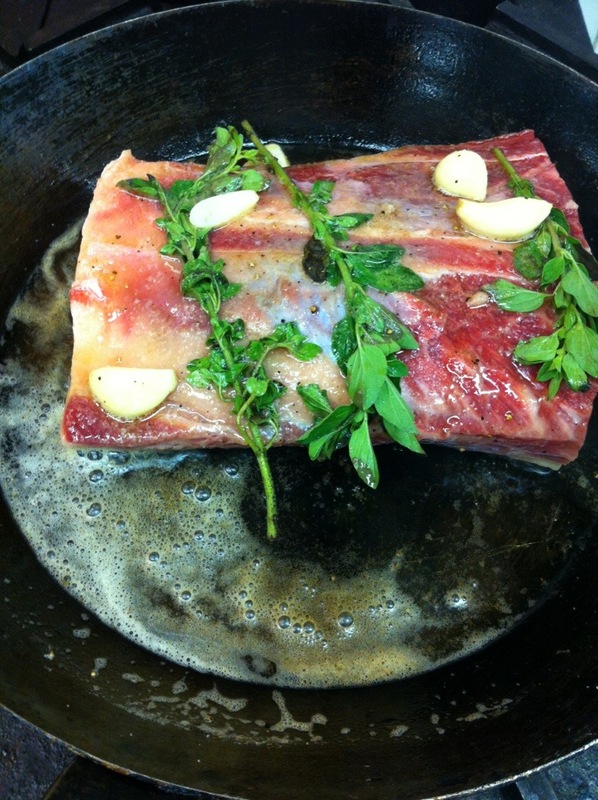 With this being said I will cook the short ribs at 138°F to see if there is a drastic difference in finished product. When cooked at 135° the meat is very tender and still pink in the middle, and when you cook a steak to an internal temp of 138° you are on the verge of a medium, which would yield a steak to have a little less pink. You will need a vacuum sealer and an immersion circulator of some sort for this recipe, and the actual quantity and size of the ribs are not that important, just know that you will need to have a larger water bath if you have more short ribs than what is in this recipe to allow for proper circulation. To start set your immersion circulator to 138°F in a tub of water. 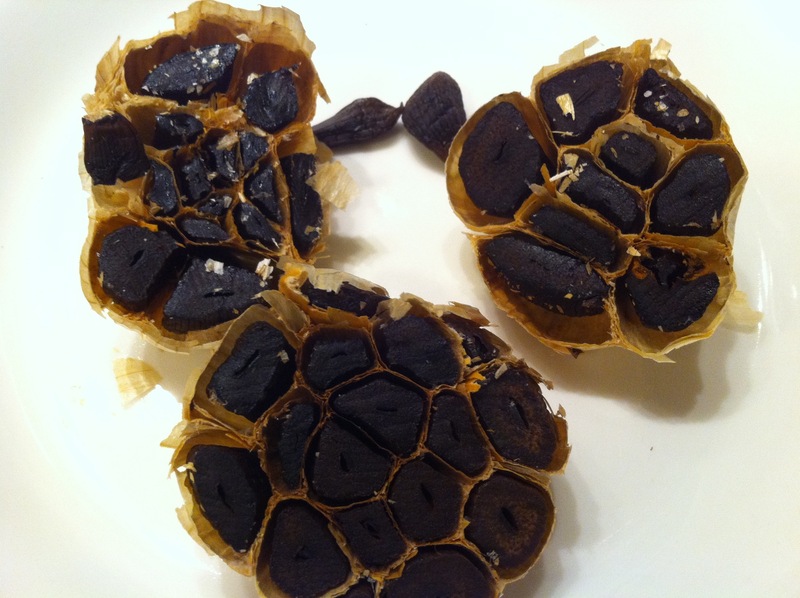 Remove the meat from the bones and season generously with salt and pepper. 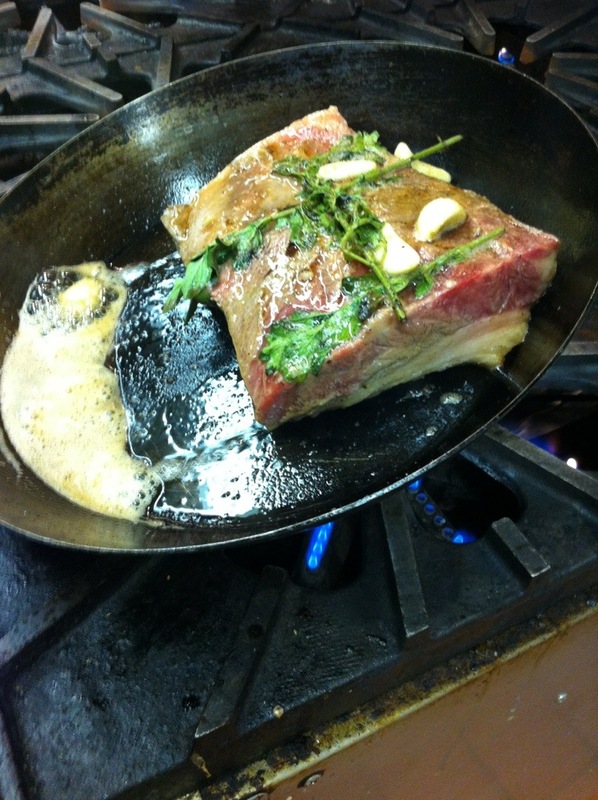 Once the butter has melted place the meat in the pan, fat side down, along with the herbs and garlic. Once the butter begins to brown tilt your pan back, works best with gas stoves, and push the meat to the elevated portion of the pan to allow the butter to pool near the handle. Pull the pan towards you to keep the butter off the heat and the meat directly above the flame. 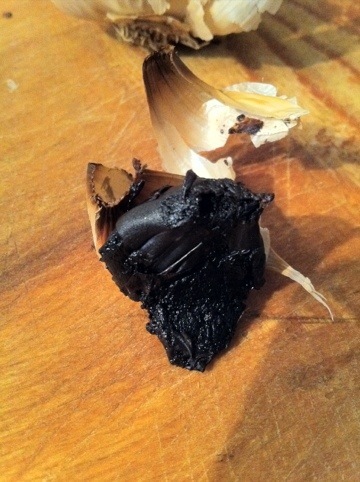 This will allow the steak to continue to brown and will prevent the butter from burning. Butter is beginning to brown. Tilt the pan and move the butter away from the heat and the meat directly above. With a spoon, continuously spoon the butter on top of the meat, checking the other side for color every couple of spoonfuls. This technique is called basting and it is the best way, in my opinion, to cook red meat and pork. Once the meat has a nice brown color flip it over and baste a few more times and set aside to cool. Once it has cooled, about 10 minutes, lay out a sheet of plastic and place the meat on it, followed by the garlic and herbs, then pour the butter over the top. Quickly lift the sides of the plastic up and wrap the meat without loosing any of the ingredients in side. Place the meat in the fridge for about 4 hours. This will allow the butter to solidify and make it easier to seal in a vacuum sealer. It is also important that is as cold as possible before vacuum sealing. After a few hours the butter should be firm and the meat should be cool to the core. 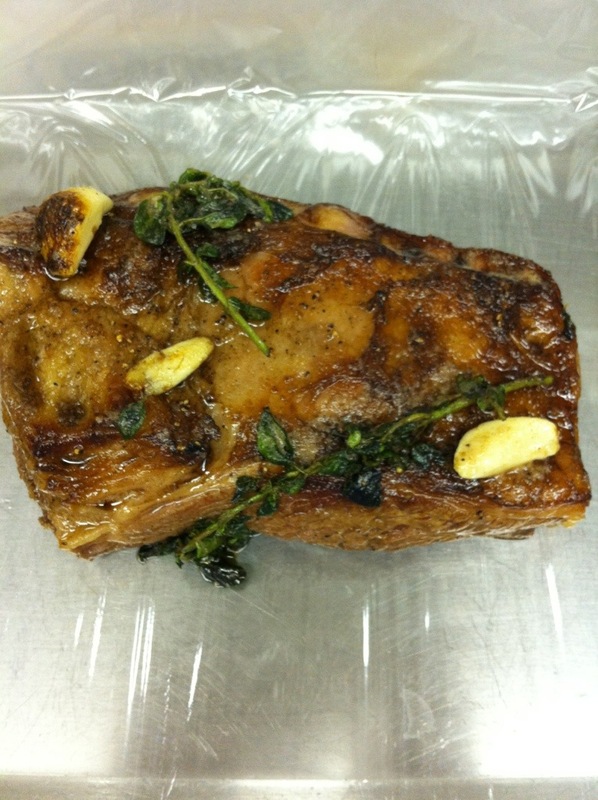 Seal the meat in a vacuum sealer and place in the refrigerator until your water bath is at temp. 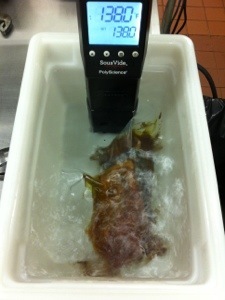 Once at temp, start the timer and drop the meat into the water bath. 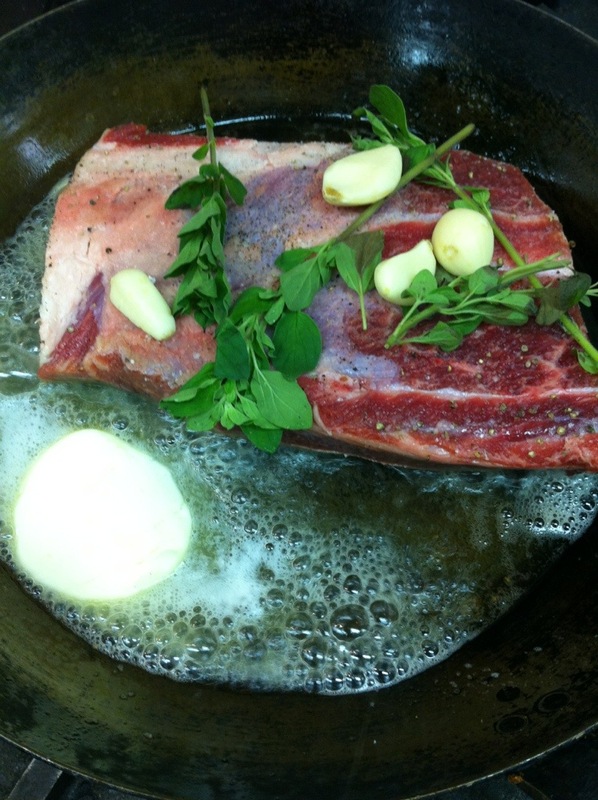 Now the painful part, wait 72 hours for the meat to cook, in the meantime start creating your dream short rib dish. When the 72 hours have expired prepare and ice bath with a little salt, to help lower the temperature, and remove the meat from the water bath and place in the ice bath. 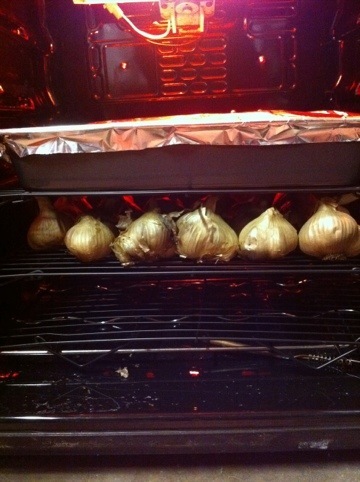 Let these sit in here for 45 minutes to cool completely. 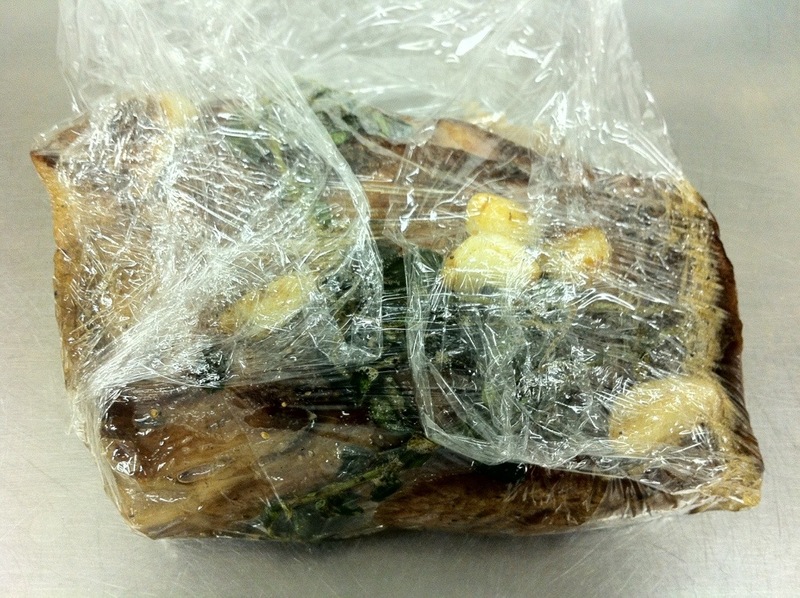 Once cooled remove from bag and wipe off excess cooking liquid and herbs. 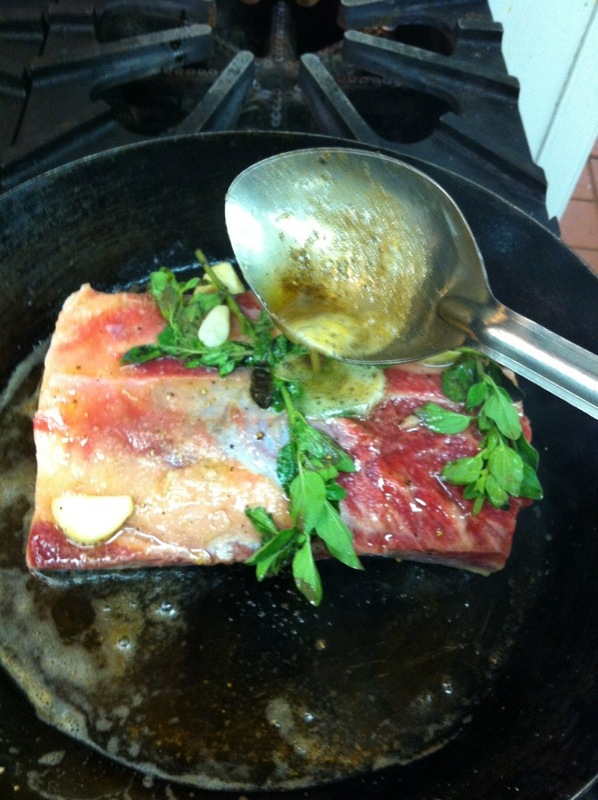 Trim the edges and square off your short ribs to the size you want to serve, mine were about 3x2x2. The meat is now ready to be seared and served to your liking, I typically brown them on four sides then cover with another pan and hit it with a little bit of water to help warm it to the center.